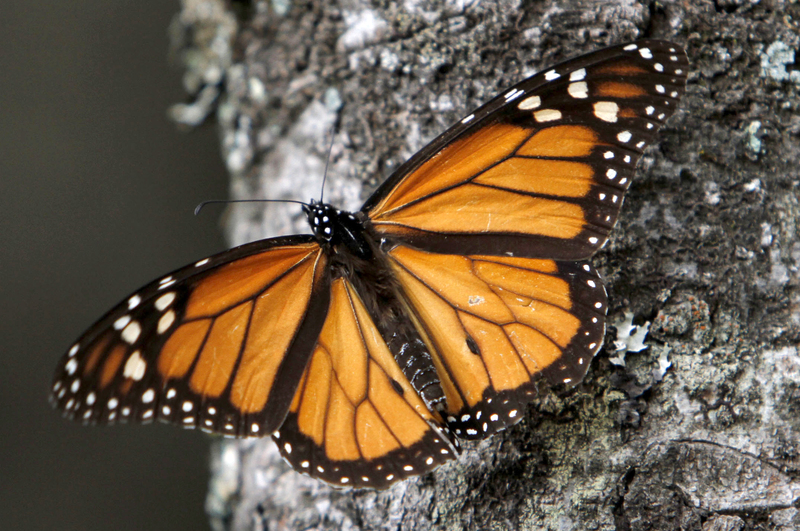 MEXICO CITY -- The stunning and little-understood annual migration of millions of Monarch butterflies to spend the winter in Mexico is in danger of disappearing, experts said Wednesday, after numbers dropped to their lowest level since record-keeping began in 1993. After steep and steady declines in the previous three years, the black-and-orange butterflies now cover only 1.65 acres in the pine and fir forests west of Mexico City, compared to 2.93 acres last year, said the report released by the World Wildlife Fund, Mexico's Environment Department and the Natural Protected Areas Commission. They covered more than 44.5 acres at their recorded peak in 1996.
} Lincoln Brower, a leading entomologist at Sweet Briar College in Virginia, wrote that "the migration is definitely proving to be an endangered biological phenomenon." Extreme weather - severe cold snaps, unusually heavy rains or droughts in all three countries - have also apparently played a role in the decline.
} But the milkweed issue now places the spotlight firmly on the United States and President Barack Obama, who is scheduled to visit Mexico on Feb. 19, with events scheduled for Toluca, a city a few dozen miles from the butterfly reserve. The migration is an inherited trait. No butterfly lives to make the full round-trip, and it is unclear how they remember the route back to the same patch of forest each year, a journey of thousands of miles to a forest reserve that covers 193,000 acres in central Mexico. Some scientists think the huge masses of migrating butterflies may release chemicals that mark the migratory path and that if their numbers fall low enough, not enough chemical traces would remain and the route-marking might no longer work.